There is a new cgminer 4.3.5 fork available with support for the Zeus-based Scrypt ASIC miners as well as Gridseed Scrypt ASICs by a user called dmaxl (source). This version brings cgminer more up to date in terms of supported features for the users of ZeusMiner-based ASICs as well as for Gridseed users. We have compiled a windows binary of this new cgminer fork that you can download and try from the link below. Do note that you may need to replace the CP2102 USB to UART Bridge Controller driver with a WinUSB one by using the Zadig software, though direct serial control will also work by specifying the correct COM port of the miner to use (check the Readme file for more details). We have successfully managed to run the miner but do note that it crashes sometimes, so it might not be working perfectly yet and it may also needs a bit more work on support. Can it run Zeus and Gridseed hardware at the same time? I can’t seem to get this working, it just hangs for me when I try to start it. Chairface, it should be able to run them together, but you need to set the right parameters for all the different devices. Riley S, the compiled windows binary has been updated from the latest source, so you can try again, now it should be more stable. can you run g-blade and 5-chip gridseeds in the same instance and get correct hashrates? JS, you can set individual settings per device, including the number of chips, so it might work. Thanks admin. I’ve been waiting for CGminer that allows setting chips per device for a while now. Have previous forks included that? I am unable to get my Zeus Cyclone 22 MH/s to start at all using CGMiner 4.3.5. Using CGMiner 3.1.1 will let it run for a few hours at a time, but I have to keep re-starting CGMiner 3.1.1 … Please steer me in the right direction. Here is a screenshot of what happens with 4.3.5 : http://s113.photobucket.com/user/anholt1/media/CGMiner435_zpsb8fc3585.jpg.html?sort=3&o=1 … Just stays like that. MIKE, what is the command line you are running the cgminer with? Make sure you pass the correct COM port or try the alternative with WinUSB driver replacement. 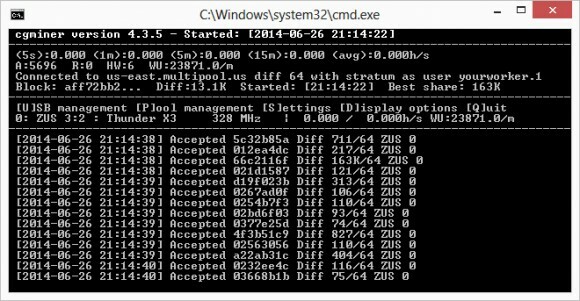 It seems that that some of the newer Zeus miners use different USB-COM chip, there is an update that should resolve issues with these, we have compiled and updated the windows binary, so you can download the new one and try again. The newly compiled version still seems to hang on me for some reason. Other versions of CGminer work fine, so I don’t think it’s a driver issue. using this .bat file: cgminer.exe –scrypt -o stratum+tcp://multi2.wemineall.com:5555 -u user.1 -p password –zeus-chips 96 –zeus-clock 328 –scan-serial //./COM21 … So currently I am back to using 3.1.1 and having it crash every 3 hours … Any Ideas? MIKE, you were apparently trying to run the new miner the same way you did with the old 3.1.1 and the new 4.3.5 version takes different commands. If you are using the WinUSB approach you do not need to set a COM port. Have they fixed the issue of the program crashing sometimes as indicated in the article??? Is there an updated fix? I Tried to use CGMiner 4.3.5 with ZeusMiner Hurricane x3. I’ve installed Zadig and use WinUsb as driver. CgMiner always crash. Any Suggestion ? I used Zadig drivers and drivers, recommended by Zeus. I restarted the PC, rebooted it, tried dozens of different syntax in command lines. I tried changing the COM port manually. I installed and reinstalled drivers. I have 25+ years of IT experience. And I still could not make CGMiner work with Hurricane X3. Welcome, BFGMiner! Anyone get this working on Gridseed blades? It just gives a usb error then stops working. One of the frustrating things about scrypt ASIC mining and all these devices, is that there ins’t a one solution. I have GPUs, Gridseeds and Zues. There is no reason why I shouldn’t be able to mine these all with one cgminer. But I can’t. I have two rigs, one for GPUs and one for my gridseeds. Now, I want to add my Zeus miners to it. Not so simple. First, my existing cgminer which I had to hack myself to suppoer both G-blades and 5-chip GSD devices does not support zeus miners. So, I grabbed one that did, the one above. I cannot run both one the same system due to some limitation with USB. They seem to cancel each other out. The one above does not properly support both G-blades and 5-chips. So I’m left with hacking at source code or setting up another system just for zeus mining. Jason – Try running linux? Both working fine together on a raspberry pi or pogoplug (debian) install, here. Compiled from the source linked above.. Auto-detect miner setup/hashing without problems.. Sounds like no one got this to work with windows? I can usually figure out anything these guys throw at us, but this cgminer is crap. Since we are using winusb, no “scan serial” command is needed. Am I right here? Well, this command line & cgminer does not work. I tried it every way possible, upsidedown, underwater, this way, that way, restarting, rebooting, unplug, replug, …etc… it does not work. I am trying the simplest config, one little fury to a dedicated PC running win 8.1 64. Of course I also tried using the cp210 drivers and naming the com port..
BFGMiner 4.3.1 is not perfect either. On coin-changing profit pools it starts to lose hashrate dramatically. I am not that good at C to tweak the source code. So, all I have left is waiting until someone figures it out. Using linux (raspian on a pi) and I’m seeing a ton of hw errors with cgminer. Pool confirms big loss of hash. bfgminer is working better, the pool reports the full hashrate, however the stats display can get a little weird after running a while. Each run above lasted about 5 minutes. I just got the Hurricane X3 today so I may have messed something up. First Zeusminer. I’ve used gridseeds a bit. Both miners built from source code. Despite the name, gridseed.give-me-coins.com, is supposed to be tuned for both gridseed and zeusminer. is it worth it? The ideal difficulty settings are very different, 1024 vs 256, are there other mismatches? Running two separate instances of cgminer seems safer. That said, like Tony above, I get a ton or HW Errors. Both in a single instance and separate instances. permetallum, probably not worth it, we prefer to run separate instances for the different miners. About the HW errors, we have observer weird behavior with the Zeus miners suddenly starting to give a lot of HW errors when using a vardiff pools and the difficulty changes. How to re install gridseed blade PC machine in 2016? I tried install old ubuntu 13.10 but is not supported anymore so there are no sources available which makes it impossible. I was foolish to let ubuntu 13.10 get updated to 14 and now cgminer is no accepting shares it runs like before but no sahares accepted.